50% off First Birthday Sale – Style at your fingertips. I just love a celebration and especially when I’m getting a gift and its not even my birthday. 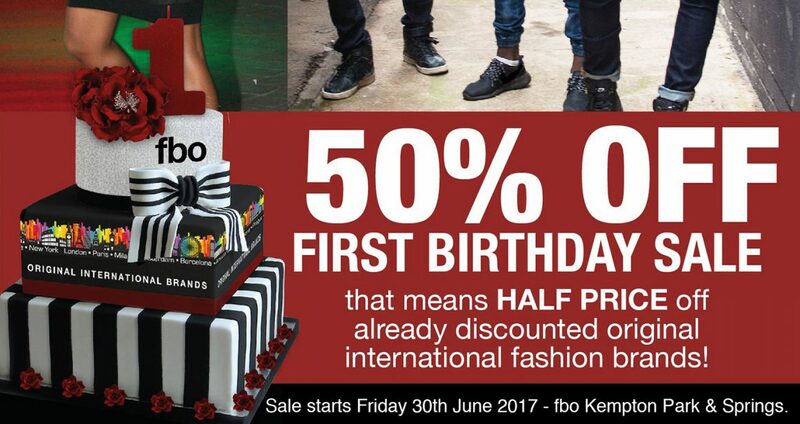 It’s a first birthday sale on at fbo Kempton Park and Springs with a massive 50% off of already discounted original international fashion brands. Numerous ladies coats like this navy blue Jane Norman double breasted with gold buttons. It’s fully lined and really classic and elegant especially when worn with the trendy and timeless stripe long sleeve top. Our price on promotion is R299 Less 50% so you pay only R149,50. The basic U top on promotion is R49 Less 50% so you pay only R24,50. It’s a celebration and you save with these fantastic offers. Don’t forget to enter the competition where you could win a share of R30 000 worth of clothing. Fill in the entry form in-store. Pop in to one of the outlets and and find your best buy of the year. fbo Kempton Park – 79 Pretoria Road or fbo Springs – 29 5th Avenue.